The Cambridge Animal Alphabet series celebrates Cambridge's connections with animals through literature, art, science and society. Here, R is for Rabbit, as we talk to Dr Zoe Jaques about the bunny's crucial place in the history of children's fiction. Dr Zoe Jaques (Faculty of Education) is a lecturer in children’s literature. Her research spans fiction for children from 1800 to the present, and in particular how children’s fantasy participates in questions of what it means to be human. Here she answers questions about rabbits in children’s fiction. What is the first fictional rabbit that comes to mind? The first rabbit that springs to my mind has to be Lewis Carroll’s albino bunny from Alice’s Adventures in Wonderland (simply because I’ve been so involved in the 150th anniversary celebrations of the text this year). He sparks Alice’s journey into Wonderland, and she encounters him many times. 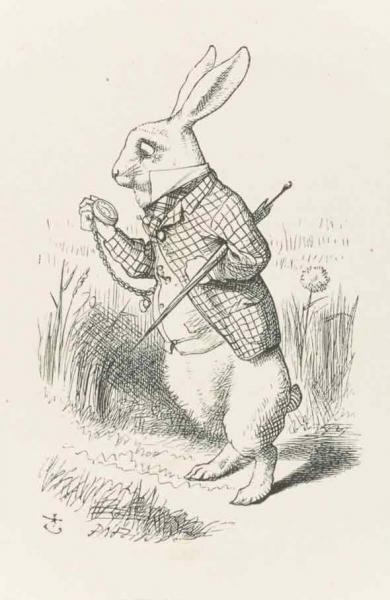 What piques Alice’s interest is that, like so many other literary bunnies, the White Rabbit has anthropomorphic action and curious attire (this rabbit, she notes, sports a waistcoat and carries a pocket watch). Tenniel’s original illustration of him is probably the best known, although Walt Disney’s animated version gives Tenniel a run for his money. Like Tenniel’s, the 1951 Disney White Rabbit wears a jacket and carries an umbrella, but he gains trousers to cover a bare rabbit bottom. Other illustrators have invested the White Rabbit with all manner of additional traits; from Arthur Rackham’s slightly eerie looking version from 1907, through to Ralph Steadman's 1967 rendering of him as ‘today’s commuter’ or Helen Oxenbury’s more kindly, portly gentleman bunny of 1999. What is clear in most iterations of Carroll’s White Rabbit is that he is not to be regarded as a pet even if his white coat and pink eyes are suggestive of the domestic. A hare features in Aesop’s fables, although these tales don’t really become associated with a child audience until the late 17th century. 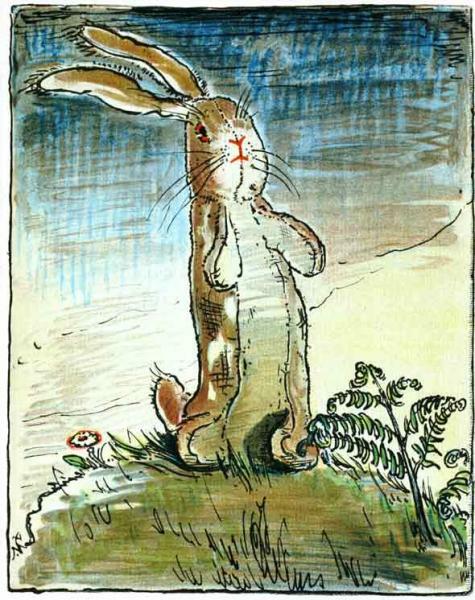 Certainly rabbits are mentioned in 18th century lesson books for children, but Lewis Carroll’s White Rabbit has to be an early example of a rabbit character in texts specifically for a young audience. Are rabbits universally popular in children’s literature? Certainly they are popular in British children’s fiction; rabbits feature prominently in A A Milne’s ‘Pooh’ books, Alison Uttley’s Little Grey Rabbit series, Ivy Wallace’s ‘Pookie’ stories, Richard Adams’s Watership Down, and, of course, Beatrix Potter’s tales. 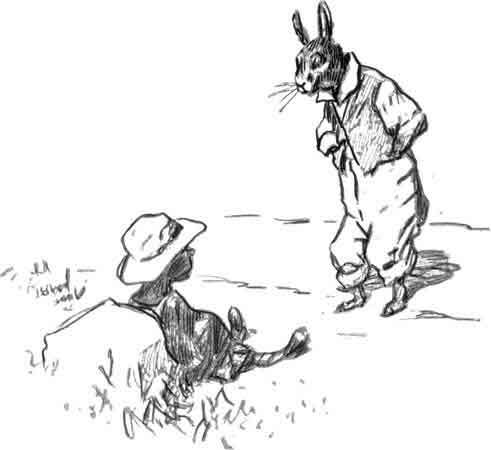 But they also have a broader heritage; one might argue that the Peter Rabbit stories owe a great deal to Br’er Rabbit in the African-American folktales adapted by Joel Chandler Harris in the late 19th century. Beatrix Potter even illustrated eight scenes from the Br’er Rabbit Uncle Remus stories in the same years as she began her first sketches of Peter. The contexts of the tales are entirely different, but certainly Potter’s Peter recalls Br’er Rabbit in action, attitude and even gait. While Br’er Rabbit moves with a ‘lippity-clippity’ pace across the American south, Peter goes ‘lippity-lippity’ through the English country garden. 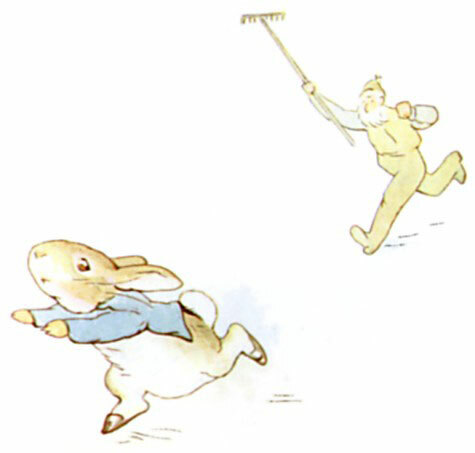 The US also gives us a host of other infamous bunnies: from 1910, Howard R Garis wrote the Uncle Wiggily Longears stories, about an elderly rabbit with a cane; the toy-rabbit-made-real is the poignant motif of Margery Williams’s 1922 The Velveteen Rabbit and Margaret Wise Brown produced a number of bunny picturebooks. Walt Disney was also something of a pioneer when it came to the rabbit – Mickey Mouse began life as Oswald the Lucky Rabbit. So although these rabbits might be distinct from their British cousins, there is certainly an Anglo-American interest in anthropomorphising the rabbit in narrative. Why have some rabbits become so much a part of British culture? There is something captivating about the rabbit, but this is not an exclusively western phenomenon. Chinese, Japanese and Korean folklore include tales of the Moon Rabbit, as does Buddhist tradition. The peculiarly British charm of Beatrix Potter’s tales made them immensely popular from the moment of their publication; more than 56,000 copies of The Tale of Peter Rabbit were printed in its first year of commercial sale. Both Alice’s Adventures in Wonderland and Beatrix Potter’s tales appeal to a particular notion of childhood which may or may not have a great deal to do with real rabbits. Alice’s curiosity, piqued by spying the White Rabbit, and Peter’s charming disobedience make for two particular compelling but also class-conscious child characters. The interest in rabbits, and anthropomorphising them as characters, is perhaps rather a curious phenomenon in British culture. Rabbits occupy an almost untenable position as animals that we eat, experiment on, own as pets and make into characters in children’s books, all within the same cultural context. They are one of the few mammals to occupy all of these distinct subject positions simultaneously. Some of this awkwardness emerges in Potter’s Tale of Peter Rabbit when Peter is threatened by the consumptive appetites of Mr McGregor (or, more truthfully, his wife, who had baked Peter’s father in a pie). This ‘accident’ is a light-hearted threat, but nevertheless it exposes the multifarious ways in which the rabbit is deployed – from a foodstuff, to a domesticated creature, to an anthropomorphic character aligned with the child reader – in British culture. Do rabbits always play the rascal in children’s stories? The naughty rabbit is a popular motif, although the rabbit has broader associations, including as an arbiter of moral good. The Easter bunny, originally a hare, was once known for his judgments on children’s behaviour at Eastertide and handing out gifts accordingly. 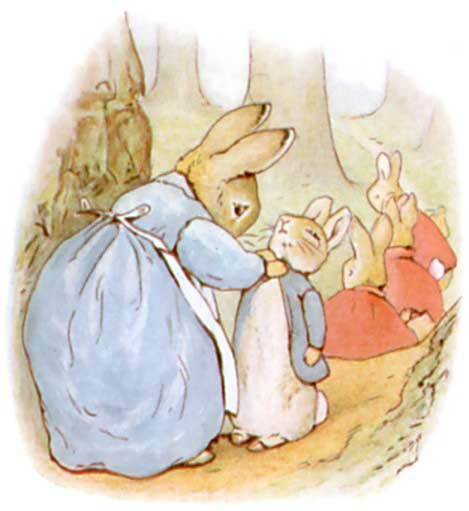 Rabbits in children’s fiction sometimes assume a rather saccharine sweetness (the Flopsy, Mopsey and Cotton-tails, perhaps, when compared to the Peters). The toy rabbit of Margery Williams’s tale navigates this line quite effectively. The velveteen rabbit is no rascal, but he isn’t insipid either, and his tale of becoming a ‘real’ rabbit is marked by its frank depiction of a child’s waning affections (which might well apply to a toy rabbit or a pet one). Rabbits are also associated with luck: Disney’s Oswald is a ‘lucky’ rabbit, Br’er Rabbit proves himself a lucky escape artist (as, of course, does Peter), and the ‘lucky’ rabbit’s foot’ is a tradition that exists in many cultures (although not so lucky for the rabbit in question). What do rabbit characters do for us: are we really trying to see from an animal’s point of view? Many texts, especially those written for children, assume the point of view of an animal. The animal autobiography has a long history, made most famous by Anna Sewell in her 1877 Black Beauty, but including earlier texts such as Francis Coventry’s The History of Pompey the Little (1751) or Dorothy Kilner’s The Life and Perambulations of a Mouse (1783). There is something compelling about the notion that certain humans are able to talk to animals in their own language, but it is also a practice in everyday communication with pets and young children. We ‘converse’ with babies and pets, assuming both sides of the conversation and translating the actions of the child, dog or cat into a response. On the one hand, these acts of translation might be considered reductive, in that they communicate an animal or child voice only through a human adult. But they also bespeak an interest in reaching across a divide to ‘know’ another person or creature. The representation of animals in literature works in much the same way: often animals are made to parrot human concerns. 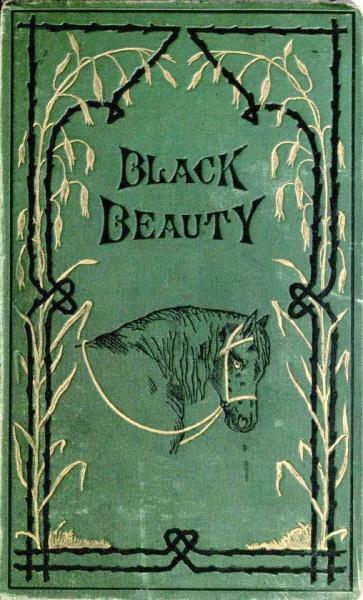 Black Beauty, for example, is as much concerned with the subjugation of women as it is with equine husbandry. I would argue that it is impossible to ‘use’ an animal only as a symbol of something else. Animal representation automatically stimulates reflection upon real animals and their relations with human readers or viewers, even if that is not the primary purpose of the narrative. Why do we sometimes depict animals in clothing? We might argue that there is a merely a romantic charm to it. There is a gaiety to a text like William Rocoe’s The Butterfly’s Ball (1807) where animals are dressed up as humans to indulge in the delights of parties. Something similar occurs in the messing about in boats of Kenneth Graham’s The Wind in the Willows (1908), although this text is also invested in moments of parody and nostalgia. The same impulses inflect narratives of toys coming to life or of miniature communities like those in Mary Norton’s ‘Borrower’ books. But dressing animals as humans also offers a playful engagement with the boundary between the human and the animal – a line which is both well established and rather strange, given that humans are, of course, just one of many mammals. By imagining ways in which non-human animals can be human-like, this boundary becomes much more permeable. Although dressing as a human might have little to do with animal subjectivity, it brings humans and animals into closer contact. It clouds the distinctions between humans and animals, and indeed between animal species. Humans are the only animals which can ever be ‘made naked’, and clothing animals introduces some rather awkward and demeaning constructions of the animal which can dislocate the creatures from their natures for distinctly human ends. Why are animals rather than human characters often used in moral tales? There is a pervasive critical view that ‘using’ animals makes a moral a little more palatable. Although dressing an animal up might bring human and animal closer in some ways, there is still a distancing that can ‘lighten’ narrative didacticism. Animals also provide a ‘veneer’ for distinctly human narratives; although I would argue that the animality of the protagonists is never entirely lost. Political satires such as George Orwell’s Animal Farm (1945) or autobiographical tales such as Han Christian Andersen’s The Ugly Ducking (1843) operate in exactly this fashion. I think one of the main reasons why animals are deployed in children’s fiction so readily – whether in morality tales of otherwise – is because of the sense that there is a special closeness between children and animals that is lost in adulthood. Authors of children’s books have capitalised on this connection. The animal story is almost entirely reserved for young readers, with the exception of the occasional satirical text in which animals play a part but are rarely the focus. Part of the civilising process of growing up seems to be the putting away of childish things – towards an acceptance of a boundary between human and animal with the former in a position of dominance over the other. This is perhaps why there are far fewer young adult fictions concerned with animals. It is a pity that the possibilities of the animal story are not more readily available to an adult audience, too. Next in the Cambridge Animal Alphabet: S is for an animal that was the foundation of pre-industrial wealth and the subject of paintings by a visionary member of the 'Ancients'. Inset images: illustration of the White Rabbit from Alice's Adventures in Wonderland by Lewis Carroll, illustrated by John Tenniel (Cambridge University Library); illustration of Br'er Rabbit and the Tar-Baby, drawing by E.W. 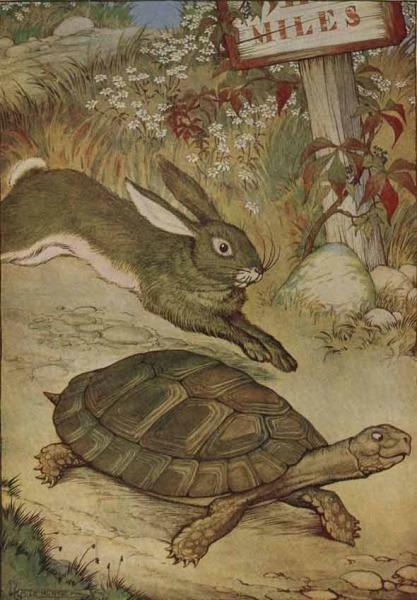 Kemble from The Tar-Baby, by Joel Chandler Harris (Wikimedia Commons); illustration of Peter being chased by Mr MacGregor from The Tale of Peter Rabbit by Beatrix Potter (Wikimedia Commons); illustration from The Velveteen Rabbit by Margery Williams (Wikimedia Commons); cover of the novel Black Beauty, first edition 1877 (Wikimedia Commons); illustration of Peter being dressed by his mother from The Tale of Peter Rabbit by Beatrix Potter (Wikimedia Commons); illustration of the tortoise and the hare from Aesop for Children by Aesop, illustrated by Milo Winter (Wikimedia Commons).